When you blog about starting a project, you know exactly how long it took you to complete it. Just about 18 months. And we’ve only finished Katie’s quilt. Not Jenny’s or Mary’s. This is mine and Katie’s first twin-size quilt. 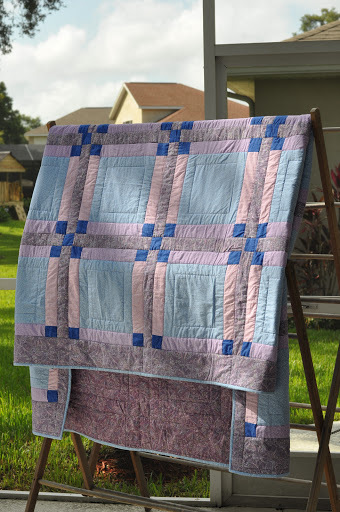 She did all the piecing and some of the binding. I did all the cutting and quilting and most of the binding. It’s not perfect, but it’s pretty. Freshly washed and drying in the sun. This is my paradise. Come and join me for margaritas. It's gorgeous, Michelle! Good job, ladies! 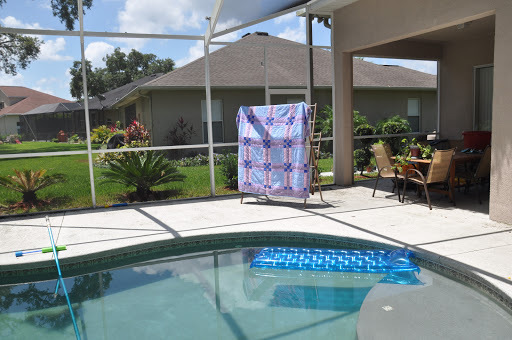 And is that a fully screened in back patio with in ground pool? Can I come live with you? Yes, Charlotte. If only the house were in the middle of 2 or 3 or 20 acres, I would think it perfect. The quilt is beautiful! I like the screened in pool. I think the screened in pool is a genius idea. (Why isn't this done up north? I should start the trend up here.) I'd love to keep bugs and small creatures out of the pool and not have to scoop the neighbors leaves out of the pool. Oh, to keep those bugs away while we are outside to play! You certainly do have a nice setup there! 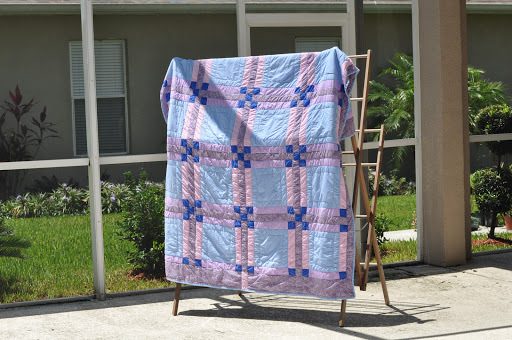 That's a very lovely quilt! You have a pool! Very cool! Amazing quilt! I'm impressed! And…I'm on my way! Karen, I'm pretty sure a lanai (a screened room like I have) would not withstand snow, so you would constantly have to repair it. I need to have several sections fixed from children throwing balls. And last summer, a bad storm dropped a tree branch on the top, and it crashed through. So they are great, and keep a lot of bugs and leaves out…but they have limits. They are also good for keeping out children and animals – since few people have fences in my neighborhood. What a coincidence! Maggie just started a purple and white quilt, I'm doing the cutting and she is doing all the piecing. I'll post pics when she is finished, in 3 days she has almost all the blocks sewn (a very easy pattern). Kat, I will love to see the pics. It didn't take long for Katie to piece hers either. The work is in the cutting and the quilting, I think. 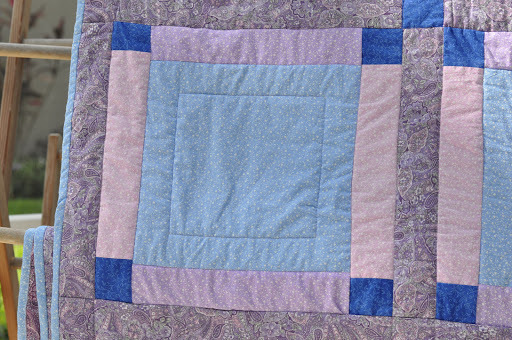 I machine-quilted this one, but that was challenging with my standard machine. Can't imagine hand-quilting like you. What will Maggie do?